Receiving massage is a blissful way to support your body which serves you 24/7. Massage helps restore balance to the multiple systems in your body that must work collaboratively. When these systems are stressed, the resulting imbalance may lead to illness and chronic pain. As an attentive massage therapist, I can help you achieve a higher sense of well-being. Massage boosts circulation, steadies posture and balance, increases range of motion and flexibility, and helps reset brainpower. At the same time, it relaxes tight muscles, decreases pain, and relieves anxiety. If you are seeking relaxation AND therapeutic massage in one session, please book a 75 or 90 minute session. I specialize in therapeutic massage to relieve chronic pain, symptoms, and tension, so I am bringing all of my training and experience to bear for your benefit. Simply put, this is a combination of all the good stuff described below, deployed specifically to aid YOU. Deep Tissue Massage releases chronic patterns of tension in the body, through slow strokes and deep pressure on the contracted area(s). Deep tissue massage therapy is therapeutic as well as corrective. 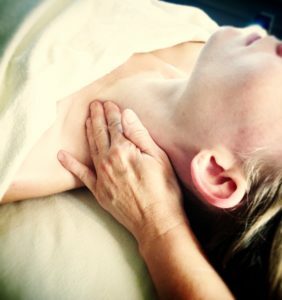 Working deeply does not equate with working harder or with more effort, but is the result of specific deep tissue massage techniques combined with knowledge of the different layers of the body’s soft tissues. Deep tissue works on all the layers of the body’s soft tissues and particularly the structure which covers and encases them – the fascia. Injury, illness or prolonged immobility can cause fascia to become stiff, hardened or stuck to adjacent structures. This in turn causes pain, reduced mobility and impaired function. Portions of a treatment can be uncomfortable at times but deep tissue’s purpose is to relieve, not impose, pain. Swedish Massage is smooth and slow. It is the prototypical massage – relaxing, calming, warm bliss. An hour of this massage pushes blood and lymph in the muscle tissues towards the heart and internal organs, replenishing nutrients and ridding the body of toxins. Endorphins are released, decreasing tension and pain. Tight muscles loosen. Your nervous system balances. You leave with a feeling of total relaxation. Trigger points are hyperirritable spots within fascia that may present either local pain or referred pain (e.g. you rotate your head to one side and pain flares up the side of your face). Pressure applied to trigger points releases the fascia, restoring the muscle to a healthier, non-stressed state. Sports Massage and Stretching helps alleviate pain and prevent such injuries that greatly affect flexibility, mobilit y, response time, and overall performance in athletic events. When competing in a rigorous event, start your day with a pre-event massage. The pre-event massage can be given sometime the day before the event or as soon as 30 minutes before you begin. It readies you for high-intensity tasks without putting you into the blissed stupor of a typical massage. Get a light massage before an event, because deep-tissue massaging irritates the muscles and takes a while to heal. Post-event massage may be beneficial from one hour up to 72 hours after the event. A good post-event massage will boost circulation, flushing toxins and metabolic waste, as well as reduce muscle tension, improve tissue elasticity, and restore calm to the athlete. I see older clients who are active and able and clients who are enduring devastating illness. While treatment outcomes are always tailored for the individual, the goals that I start most sessions with are to increase comfort, care, and circulation. Gentle massage re-establishes our essential need for touch and can help the client deal with challenges that more often come in later life: loss, grief, significant health issues, diminished activity. This massage lowers blood pressure, re-establishes connection, increases coordination, and reduces pain. PLEASE NOTE: Some people are too medically frail for massage. Massage is meant to relieve symptoms of pain and stress; if receiving a massage exacerbates ANYTHING, please do not schedule until you are cleared for massage by your physician. Massage PACKAGES are available! Six 75-minute massages to be scheduled within one calendar year $450. Make routine, excellent, self-care your priority. Regular massage is one of the kindest, most beneficial things you can do for yourself – for your body and your brain. The ability to relax and reset helps us face our obligations with greater serenity. We move more freely and easily through our days. Our immune system is stronger. We sleep deeper. We build resilience. One thing I love about massage is that there is zero screen time; my focus is 100% on you – until checkout, when it’s time to schedule and pay; devices come out, calendars come up, cards are swiped. These are essential parts of any business but I do notice that it can disrupt the peace that follows us out of our session. So, for those of you who are interested (and thank you to my current subscribers! ), I will continue to offer massage subscriptions in 2019. Subscriptions run the full 2019 calendar year. The deadline to begin your subscription is Jan 20, 2019. A subscription eliminates the impulse to skip massage due to lack of funds in the moment. Subscribing and scheduling in advance ensures you stay committed to your regimen of self-care. When you subscribe, you do so with less cost and preferred scheduling. A subscription means your preferred day and time remain yours and payment is automatic; you can wave and go. I offer subscriptions at 75 and 90 minutes because that is the optimal, minimal time for both relaxation and therapeutic benefits. You simply commit to the 2019 subscription you want – once a month, or every two weeks, or weekly. *Subscriptions paid in full at the beginning of the year come with an additional one-hour gift certificate (additional $70 savings). Subscriptions are non-transferable and non-refundable. Gift certificates may be redeemed when subscription is paid in full. Subscriptions may not be combined with other incentives (e.g., the $30 gratitude bonus). If you choose auto-pay and your credit card information changes, please notify me with updated information before the next payment. Credit card information is securely stored in Stripe. 24-hour advanced notice is required for any appointment cancellation or reschedule. Cancellations or reschedules made with less than 24-hours notice will incur full-service charge. No penalty for cancellation or reschedule with more than 24 hours notice. A signed subscription agreement is required. I know many of you are busy considering which gifts you’ll give this season to those you love. Remember to show that same loving care to yourself. May you enjoy a peaceful and serene December and new year.